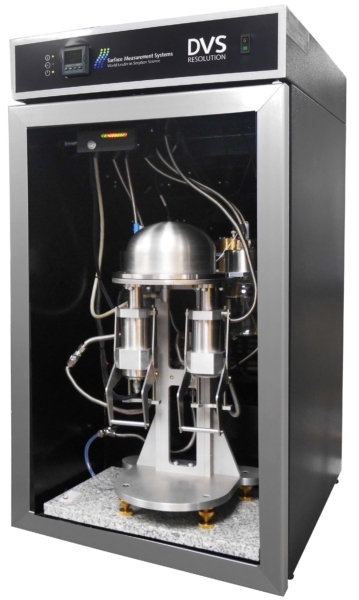 DVS Resolution is a dual vapor gravimetric analyser, with key feature, is the combined ability to precisely control and measure temperature and relative humidity while recording the highest resolution changes in mass. DVS Resolution uses a dry carrier gas typically nitrogen or compressed air for its operation. Digital mass flow controllers regulate flows of dry and saturated gases. Relative humidity is generated by precisely mixing dry and saturated gas flows in desired flow ratios which produce expected relative humidity. 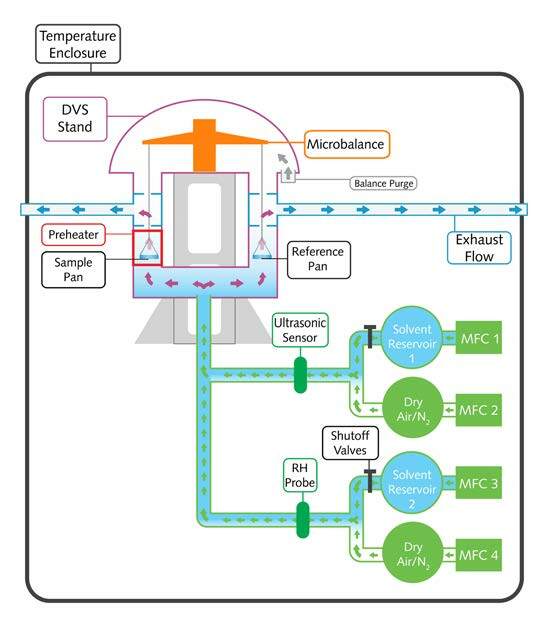 In a typical experiment a known concentration of water vapor is delivered over a sample placed inside the sample pan connected to the Surface Measurement Systems UltraBalance™ measuring realtime mass changes caused by sorption or desorption of water molecules. Prior to sorption measurements, the sample can be in-situ preheated/dried at temperatures of up to 200 oC. Additionally, the sample chamber and water vapor generation are at thermal equilibrium in a single temperature enclosure allowing for operation over the entire temperature range (5-85 °C) without risk of condensation. most advanced experimental design and data analysis. Complex protocols for multiple experimental sequences using sample pre-heating and conditioning; isotherm, isobar and ramped humidity and organic vapor methods; single or dual vapor delivery and control; fixed time or mass derivative steps. 21CFR Part 11 software solution is available for all DVS software upon request.